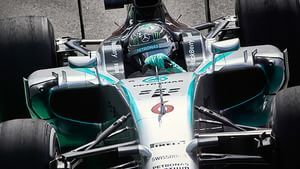 Nico Rosberg topped the times, with his Mercedes teammate and current championship leader Lewis Hamilton just a tenth of a second slower in the final hour of practice in Brazil. The two Williams drivers were next in line, with Daniel Ricciardo best of the non-Mercedes powered cars. Jenson Button improved after missing out on some running yesterday, whilst Jean-Éric Vergne struggled having sat out FP1 and been forced to curtail his practice session in FP2. Sebastian Vettel remained in the midfield, just ahead of the Lotus drivers and Adrian Sutil in pace.